Skechers USA Inc., the casual footwear brand that was tripped up by its line of “toning shoes,” is now outpacing traditional athletic-shoe companies at their own race. Skechers accounted for 5% of the sports-footwear market for the quarter ended in March, according to retail tracker NPD Group, moving past Adidas AG ’s 4.6% as well as the 4% shares notched by Asics and New Balance. Nike Inc. and its proprietary Jordan brand together account for 62% of athletic shoes sold in the U.S. But Skechers’s rise highlights Americans’ growing preference for cheaper shoes they may actually never use for running and the threat that trend poses to some established athletic brands. Most of Skechers’s growth has come from its walking and casual footwear segments, according to NPD Group analyst Matt Powell. “Walking has been relatively dormant for a number of years, and they’ve kind of reignited it,” he said. 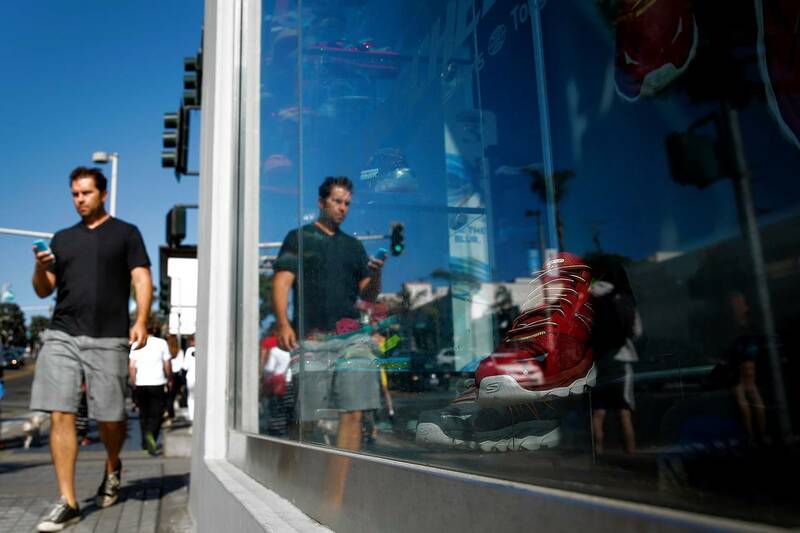 The Manhattan Beach, Calif., company is the latest beneficiary of the so-called athleisure trend in retail, with shoppers snapping up sport-styled clothes and shoes regardless of whether they plan to work out in them. By offering stylish, casual shoes at a fraction of the price of more traditional athletic brands, Skechers has gained a foothold with family footwear and department-store consumers. David Weinberg, the company’s chief operating officer, said retailers’ demand for Skechers has been strong, with the company adding new accounts and expanding shelf space at existing customers. After dipping earlier this decade, Skechers’s sales have resumed their growth, climbing 29% last year to $2.4 billion. Its shares are trading around a record, up 1.3% on Monday at $102. Running is the largest U.S. athletic footwear category by retail sales, according to SportsOneSource. For the first time, sales of fashion-focused casual shoes are driving sales instead of the more sophisticated running shoes that long propelled the category, according to the firm. Skechers in 2012 paid $40 million to the Federal Trade Commission to settle false-advertising claims about their Shape Ups shoes, which were touted to tone the buttocks. The company disputed any fault at the time. The growth of Skechers’s footwear business marks another challenge for Germany-based Adidas. The world’s second-largest sportswear brand by revenue has slipped in various U.S. rankings. Last year, Adidas fell behind Under Armour Inc. in combined U.S. footwear and apparel retail sales, according to data from Sterne Agee CRT and SportScanInfo. Over the past year, the company has shuffled its American management and redoubled its efforts to improve its business here. Adidas reported a 7% increase in North American sales for the quarter ended March 31.